Moreover, by implication and by fact: Climate change deniers are wrong. I say this because the first part of the fifth Assessment Report by the Intergovernmental Panel on Climate Change is now out, and it’s incredibly clear. Emphasis mine. Still, that’s the major fact to walk away with. The biggest change over previous reports is how confident scientists are that humans are behind global warming. We’ve known about the effects, and now we can be quite sure that our own emissions are behind it. Politically, this may be the most important part. People like James Inhofe (R-Okla.) can spew ridiculous assertions and continue to live in a fantasy world, but this part of the IPCC report is specifically written for policymakers. The increased certainty over previous reports is what they need to understand. Still, the ramifications of climate change need to be driven home. The report has many. In fact, right after that opening salvo they go on to say that each of the last three decades has been warmer than the last, and all three have been warmer than any other decade since 1850. Land and sea surface temperatures averaged over ten year periods. As you can see, the last three decades have been warmer than any before, and the 2000-2009 decade warmer by far. Averaging over a decade is a good way to show this because temperatures change quite a bit year-to-year, and climate change only starts to show itself after a sufficiently long period of time. If you look on shorter time scales, you might think things are warming faster or slower than they really are. 1) We’re talking surface temperatures here, which is not the best way to represent the extra energy the Earth has absorbed from the Sun. 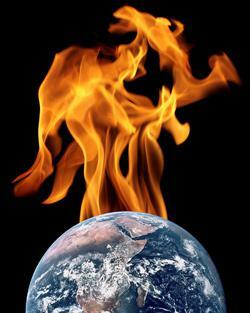 Climate change happens because the amount of heat absorbed by the Earth from the Sun is not balanced by the amount the Earth radiates away into space. Give off too much and the Earth cools; keep too much and it heats up. Greenhouse gases in essence trap heat, so the more carbon dioxide we put into the air, the less heat the Earth can shed, and we warm up. Right now, that extra energy is getting transported into the deeper ocean. We know this is happening. And the ocean is a much, much bigger reservoir of heat than the air is —it can store and transfer far larger amounts of heat than air (that’s why a sauna set to 80° C will be relaxing, but a hot tub set that high will quickly kill you). As the IPCC report notes, ocean temperatures are rising. 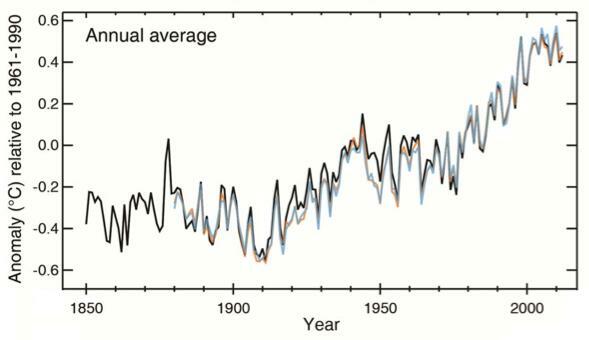 Land and sea surface temperatures on an annual basis. Let me ask you, and answer honestly: What’s the very first thing you notice about that plot? It’s obviously the steep rise in temperatures since about 1900. But note that there have been several times the slope of that rise has changed. 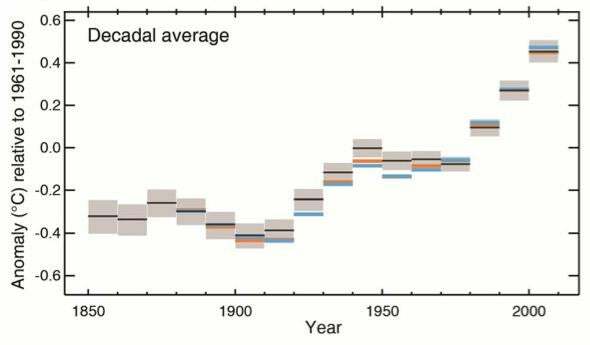 From 1940 – 1960 it was fairly flat as well (you can see that in the decadal average, too). But then it took off again, shooting back up. It also rose steeply from 1900 to 1940 or so after a period of mild cooling. The point is, the trend over time is up. Natural variations can cause cooling — ocean absorption of heat, volcanic explosions, aerosols sent into the air by humans — but those are at best small variations on the much larger trend. And that trend is hot. So no matter how much the denial machine froths and fumes at this latest so-called “pause”, the graph makes it very clear that all of this has happened before, and will happen again. But to think this means climate change has “stopped” is simply foolish, and anyone trying to make that argument is clearly wrong. · Atmospheric carbon dioxide levels are rising, as are methane and nitrous oxide levels, and are higher now than they have been in 800,000 years. Annual amount of atmospheric carbon dioxide (in parts per million), measured at Mauna Loa. That last one is the key to this whole thing. We have been dumping all three of these greenhouse gases into the atmosphere at a rate of billions of tons per year for the past century, and that’s upset the natural balance of the planet. We’re heating up, and it’s our damn fault. This is the new normal. Hotter temperatures, more extreme weather, loss of ice at the poles. Ocean acidification is scary, too; that’s already affecting corals, causing die-offs, and can have negative impacts on the entire food chain in the oceans. There are plenty more, but that’s enough to give you the gist. Of course, the deniers have been spinning at nearly relativistic speeds trying to downplay this report. They talk about the pause, they talk about how sensitive the climate is to CO2, they talk about the IPCC being unreliable. But the bottom line is they’re wrong. Ironically, due to its very nature, the IPCC is actually quite conservative; the panel has actually been getting flak from real scientists because the observations — heat absorption, ice loss, sea level rise, and so on — have in almost all cases actually outpaced predictions from earlier reports. In reality, things are worse. So there you go. I know a lot of people will be saying I’m being alarmist, but you know what? I’m being a realist. Climate change is alarming. And if someone denies that, denies the facts, denies the conclusions of thousands of actual climate scientists, denies the evidence, denies that CO2 is a greenhouse gas, and denies that there’s even a problem, well, what does that make them? I’d much rather know the alarming truth than be in constant denial while things get worse all around me.